One of the reasons for a country to consider a soft peg is that the country wants to manage its exchange rate, to promote its policy of economic development. In such a case, the country can overvalue or undervalue the domestic currency to aid its development strategy. If a soft peg is used to promote a certain development policy, it’s done to either overvalue or undervalue the domestic currency. The objective itself has changed from overvaluing to undervaluing during the last decades. Until the early 1980s, the objective of most developing countries was to industrialize, whether or not these countries had a comparative advantage in industrialization. This policy was called import substitution because the objective was to produce previously imported goods domestically. But these countries faced formidable barriers to industrialization. They had limited resources, and industrialization was expensive. They also couldn’t produce the entire final good (say, cars) domestically and were dependent on the imports of intermediate goods, energy, and so on. The import substitution strategy worked based on overvaluing domestic currencies. For example, as with other developing countries, Turkey followed the import substitution strategy until the early 1980s. The figure shows the market for the Turkish lira, where the exchange rate is the dollar–Turkish lira exchange rate. The figure also indicates that if the lira were traded in international foreign exchange markets, the equilibrium exchange rate would be $0.60 per lira. Instead, the central bank announced that the exchange rate is $1.20 per lira. This example illustrates overvaluation of a currency. 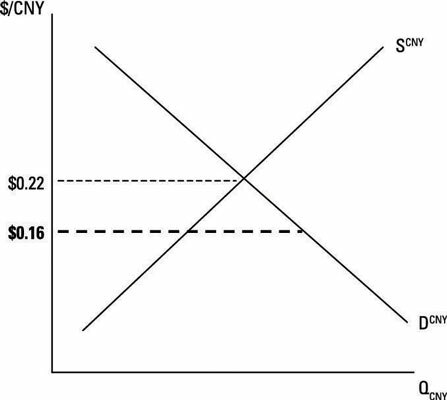 An overvalued currency makes imports cheaper. Considering the fact that the import substitution strategy required the import of intermediate goods, energy, and so on, many developing countries pegged their currencies to make their imports less expensive. In fact, countries such as Turkey maintained a variety of official exchange rates, depending on the goods they were importing. In terms of imports, overvaluation was exercised at a higher degree for goods that are strategically important for the country’s industrialization efforts. Starting in the early 1980s, the approach to economic development changed globally from import substitution to export promotion. An undervalued currency makes the foreign price of the domestic good cheaper, which promotes the country’s export potential. Even before the introduction of the export promotion strategy, developing countries were concerned about their exports. As in the case of imports, many developing countries applied different exchange rates applied to exports as well. 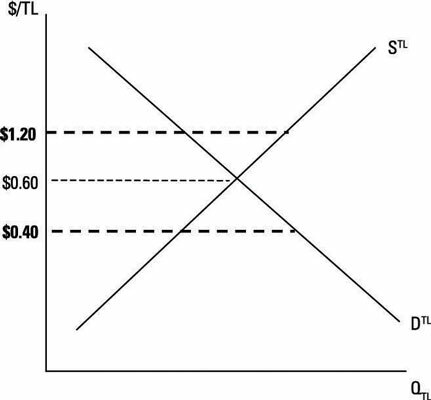 Looking at the Turkish example, the exchange rate of $0.40 per dollar implies the undervaluation of the Turkish lira, which would make Turkish exports less expensive. Again, most countries applied undervaluation to their export goods at varying degrees, depending on whether they faced serious competition from other countries. Higher degrees of undervaluation applied to export goods that other countries also produced cheaply. China is an obvious example of undervaluing a currency. The following figure shows that the current peg of $0.16 per yuan (as of November 12, 2012) is below the equilibrium exchange rate. Because some estimates put the current peg up to 40 percent below the equilibrium exchange rate, you see the equilibrium exchange rate as $0.22 per yuan. As in other developing countries, China followed the import substitution development strategy until the early 1980s. The dollar–yuan exchange rate was $0.58 in 1981. After changing to the export promotion strategy, the exchange rate went down to $0.12 in 1994, which was below the undervalued exchange rate of November 12, 2012. Mainly due to criticism from developed countries, China implemented smaller revaluations in the early 2000s. This is called a crawling peg, when a country gradually devalues or revalues its currency. The undervalued Chinese yuan, together with a lower labor cost, gave China stellar export performance, which led to large accumulations of foreign currencies (especially the dollar) by the Chinese central bank. Foreign exchange reserves of the central bank were $2 trillion in 2010. You may have heard that China holds a large amount of U.S. government securities. When countries like China have large current account surplus, they become lenders to other countries. They buy bonds issued by other governments, which is just like providing a loan to these governments. As of 2009, China had more than $1 trillion of U.S. government bonds. As the Chinese government allows the yuan to approach the equilibrium exchange rate, China will start losing its foreign currency and asset holdings. Some fear that China will dump its dollar and dollar-denominated security holdings. But such a move would undermine the pegged exchange rate and significantly appreciate the yuan, worsening China’s export performance. If the objective of a soft peg is to create an advantage for a country in international trade, countries need to implement serious capital controls. In this case, if the currency isn’t freely traded and the central bank of the country unilaterally determines the exchange rate, the country should control not only international capital flows, but also its citizens’ access to foreign exchange. All developing countries that have implemented soft pegs for trade reasons have seen a lively black market arise for foreign currencies.